We don’t know how to stop. Our waking hours have taken over our sleeping hours. Even our sleep and rest is in service of doing more, rather than being more. We don’t sleep to be rested, to revitalize and nourish ourselves, we sleep so we can get up and do more the next day. We haven’t mastered the art of nondoing along with the art of doing. We haven’t learned how to relax in action. Yoga Nidra is an age-old practice of Yoga described in the ancient texts. It is not new. It is composed of a series of breath, body and awareness techniques designed to help you move into progressive states of relaxation, of non-doing. Though it is impossible to achieve relaxation with greater effort, you can enter a non-doing state where you are doing nothing and relaxation happens. The techniques of Yoga Nidra are active techniques that allow access to the non-doing state of being. The function of the technique is to do in such a way that you slip into a state of non-doing, so much so that the experience of the body and mind can disappear completely for a time. The result is a highly regenerative state where the energy normally burned by the mind is fully freed to heal and restore the body. This healing energy of the body, freed from the mind, can also become a spiritual force, unlocking inner guidance, knowing and insight into your true nature. 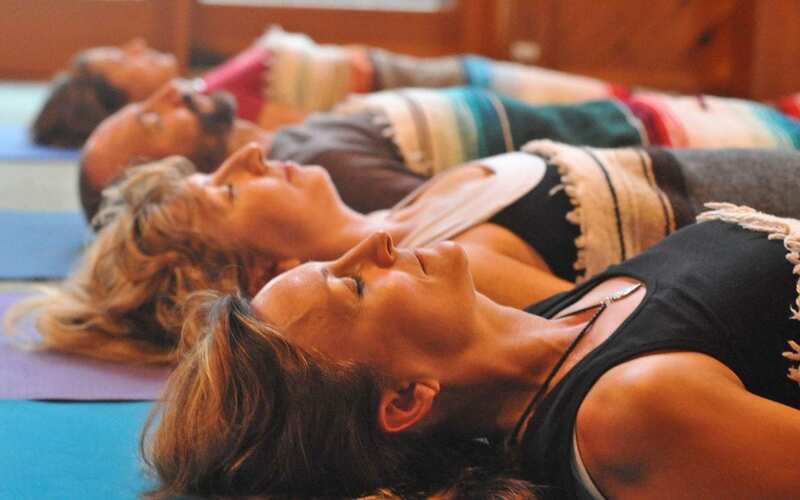 Yogis state that 45 minutes of Yoga Nidra is as restorative as three hours of sleep. Yoga Nidra is regenerative, but it is more than a nap. It is a spiritual practice that, through a structured and conscious movement through sleep states, takes you to realms beyond the mind and into the fourth state of consciousness beyond waking, dreaming and deep sleep. Ancient Yogis knew that a vital, rested and restored body is a necessary first step toward inner awakening. Yoga Nidra is a practice that can be used at many different levels, all of which serve our ultimate potentials as human beings and as evolving souls. It is up to us to determine how far we want to take the practice and for what purpose. Its beauty is that it addresses the entire spectrum from the concrete to the most subtle. The beauty of Yoga Nidra practice is that it can serve as a laboratory within which to practice the knowledge. Here, the teachings come alive. We have a chance not just to know them intellectually, but to experience how they work through our own body and mind. This merging of understanding, enhanced and deepened through personal practice, is a potent combination. The teachings are no longer something to “think” about, they become something we may embody and become. Get 5% off Any Program! Join our mailing list to receive the latest updates on upcoming programs & events. New subscribers will be sent a discount code good for 5% off any program! We strive to only provide relevant and interesting content to our subscribers. You may opt-out of our list at any time, but we'll miss you!